I was a bit apprehensive about starting this book, as I thought it was going to be heavily philosophical and difficult to read: a longwinded essay. How wrong I was! In reality, I actually found this book hard to put down. 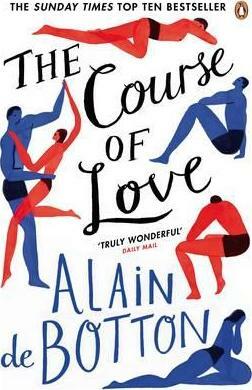 So easy to read, it is fascinating in its way of peering into another couple’s life; watching the good, the bad and the awkward weave through daily life in somebody else’s relationship. I picked up The Course of Love looking for any tips or advice to bring into my own marriage. With a baby under one, I felt like my husband and I put all of our patience, love and energy into keeping our little one not just fed and watered, but happy, active and smothered in love. There wasn’t much left over for each other. And the book delivered. There was a key moment which stood out to me so much, I took a photo of the paragraph and shared it on Instagram. What can I say… I am Gen Y, after all! ‘The child teaches the adult something else about love: that genuine love should involve a constant attempt to interpret with maximal generosity what might be going on, at any time, beneath the surface of difficult and unappealing behavior. The parent has to second-guess what the cry, the kick, the grief or the anger is really about. And what marks out this project of interpretation – what makes it so different from what occurs in the average adult relationship – is its charity. Parent are apt to proceed from the assumption that their children, though they may be troubled or in pain, are fundamentally good. As soon as the particular pin that is jabbing them is correctly identified, they will be restored to native innocence. When children cry, we don’t accuse them of being mean or self-pitying; we wonder what has upset them. When they bite, we know they must be frightened or momentarily vexed. We are alive to the insidious effects that hunger, a tricky digestive tract or a lack of sleep may have on mood. While I can’t pretend that I have been entirely successful in putting this wisdom to action, it has been front of mind and I’ve been able to bite my tongue more than I was prior reading this book. I would absolutely recommend it to anyone who is in a relationship, or wants to be in a relationship that is different to the ones that have preceded it. Part story, part wisdom and all easy and riveting to read, this little gem is one to reflect back on again after reading it from cover to cover.